The Shifters timeline is somewhat divergent from ours, and some key events in history played out somewhat differently. Remember when I originally wrote Shifters it was like 1997? So that's when I originally figured my timelines. The west had been spared much of the initial exposure, although travelers who'd been in the east in the 11 months prior had brought it back with them. The mega city areas enacted quarantine procedures and controlled the diseases relatively quickly within their respective borders which began a certain isolationist culture within both Pacifica and Shade City, however, refugees were demanding entry to the west and eastern megacities, which prompted accelerated growth of all four mega city projects and the addition of two more in the east. The plague decimated the population, particularly in the central to eastern US over the next five years. A terrorist group from the Middle East claimed responsibility for the attack, however the US discovered that it was covertly backed by a small group of Middle Eastern countries in response to the earlier war's atrocities. The US government was given permission to 'go after' the terrorist group in question and anyone who harbored them. this became the war known as Middle Eastern Conflict, and was considered to have lasted from 1996 - 2005. However, because of the waning power of the US, budgetary issues, domestic civil unrest, environmental and food crisises on the homefront, they were forced to withdraw their main forces. The conflict in the Middle east continues, but is limited to smaller strategically deployed teams and technology based units. In the time the government was busy, the corporations seized the opportunity to woo many changes to laws to be favorable to them to run many programs and control a lot of civil life in the name of safety and well being of the citizens, saving the government money, and putting themselves in positions of absolute power over the cities they funded. As a result, currently, the Mega Cities are more like corporation states, where the government is there more as token than law of any sort. The corporations can pretty much do whatever they want to with the citizens who live and work in the Mega Cities that they want. Military service does guarantee one can get access to a Megacity home (this is not always the case for all 'immigrants'), although its often not in the nicest areas, but they get a place to live, and a meal/pension for their service, as well as job opportunities through the corps. This is part of the deal the corps have with the governments. I've included a map to show the general state of things in current time. To really know a normal life, a character would have to be probably about 45 years old. just wondering did any thing happend to alaska or hawaii at all? Alaska and hawaii were fine due to their extreme distance from the event. However, because of the refugee problem and the possibility of contamination, plus both having relatively fragile environments, both have restricted travel severely to the point of almost being isolationist beyond tourist travel. They have resort facilities for people wishing to vacation in those locations. But residency is strictly controlled. 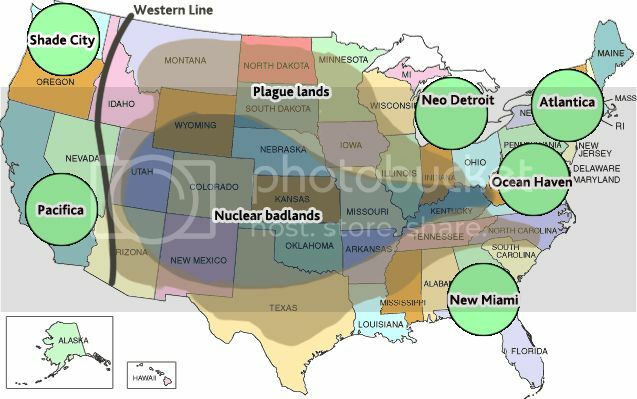 How denuded of vegetation are the Nuclear badlands and Plaguelands? Is it similar to Chernobyl in that nature has largely reclaimed the land, but it is still quite radioactive? Or was the devastation much more intense than that? Daggertooth wrote: How denuded of vegetation are the Nuclear badlands and Plaguelands? Is it similar to Chernobyl in that nature has largely reclaimed the land, but it is still quite radioactive? Or was the devastation much more intense than that? i think it would be Chernobyl bad? Yeah, you're looking at Chernobyl type situation. Nature has taken a lot of it back over, but its still too radioactive for people to live there. Its also in the middle of the plaguelands (they overlap), so while yes, there are humans who live there, most are mutated to some extent, and in the bad, ugly mutant sort of way, not the cool 'I've got powers' sort of way. A lot of people die of cancer before the age of 40 in there, if they live through childhood. Even the veil creatures don't do well in radiation. They have a higher resistance, but it causes other issues with them. The only creatures that are unaffected are awakened Espi. Veil creatures are also unaffected by the plague for the most part. Escari, Psions, and Mages are still affected though. Vampires, Shifters, Elves, Espi, and Sygils are not.